What are the pitfalls of an X301? Been looking to try a new laptop; curious about the X 00/01 thinkpads. 1. Batteries. Both the inside and the bay one. A T400s might be better in this regard; but I assume it'll suffer the same issues. 3. HDD/SSD. Those 1.8" are rather uncommon from what I hear. Probably the best argument against is that it's not such a huge bump from my X61s. Still, anything I missed or should know about? Re: What are the pitfalls of an X301? If you need a battery to last longer than 2 hours a X301 is problematic. The TN panel isn't great and to replace it with something better would be expensive. On top of this for today they only have enough CPU power to do general tasks. Saying all that I still use one as a daily driver especially while I am on the road. If interested, make me an (PM) offer I cannot refuse. If you're looking for a nice thin'n'light classic Thinkpad that can handle modern tasks... you should skip T400s and T410s for having sucky screens and bad battery life too. You'll only get decent battery life starting with the T420s 6 cell + ultrabay, and then the T430s with all of Ivy Bridge's efficiency benefits, again 6 cell + ultrabay, the classic keyboard mod, and the IPS FHD mod. If you care for the novelty, by all means pick up an X301, they're really cool especially the light up bits and A31 style volume buttons on the keyboard. I tried making the same jump - from the x6xs to an x301. Other options I tried included: x62, x200, x200s, x201, x201s, x220, T420s. The size and weight of the x301 is great. As is the construction. Keyboard has about the same spacing as the x61 - kb on my x301 is a bit too stiff for me. I don't have a battery. The huge problem I had with the machine was the low contrast TN screen. I am not sure if Xiph has leds for it - screen may be too thin, and even if he did it wouldn't help the contrast much. I didn't notice much, if any, performance boost between the SU9400 and the L7500. 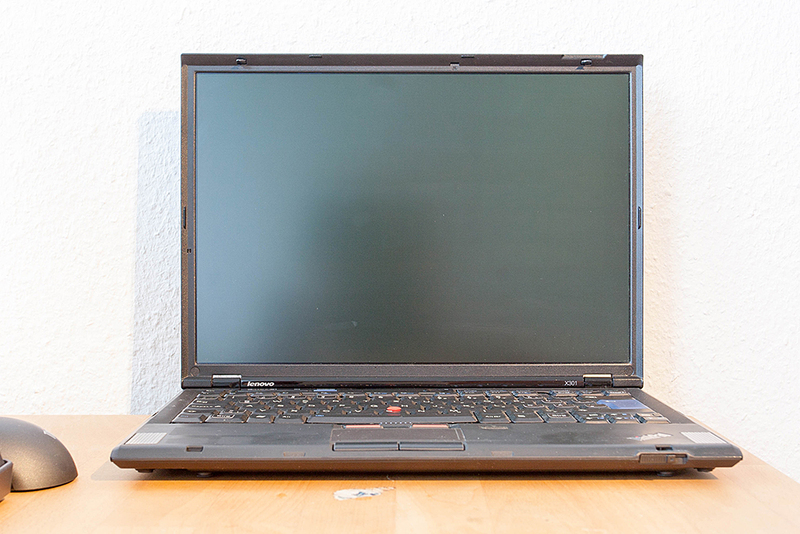 The x200 with a P8600 or P8800 is worth considering. The x220 with an IPS is another choice, if you can stand the screen format. Still another option, would be keep the x61s but overhaul your software -- review the software you use and either find more effecient software or optimize the software you have. I'd pick up an X301 for the keyboard. That keyboard is A DREAM to type on with snappy domes and a super comfy rubber palmrest. I'm on a fullscreen mode most of the time. I guess my best bet would be an SXGA LED, but I have a feeling I'll have "good luck" finding one. Thanks for the replies everyone, the X301 idea is trashed. 4:3 wins gain! And how do you think about X62 as jump from X61? Some other ThingPads to stand in line: T430u - ultrabook but with the chiclet keyboard (i don't know can it be cured with classic keyboard mod like on T430, T(W)530) and upcoming X210. Last week i have gotten my X210, have assembled it and have loved it. Fullsized keyboard with normal Esc and Del from X201 + WUXGA screen and last gen Core-i CPU. Last couple of years X201 with IPS screen mod was my daly driver. And now i think i can move on further. My computer work is on Linux doing low cpu-intensive tasks (command line, often on remote machines, coding and reading text on simple web pages). For these tasks there was no difference between the x61s and x62. No difference between the L2400 and the I5-5200u either (for those tasks). The x62 has a huge performance boost over the x61 for video playback and rendering, and cpu-intensive computing. When I need compute power, I turn on another machine and connect to it over ssh from my x60s. – the T420s is nice given the fact it has an mSATA drive coupled with a 500 GB hard drive. The i5-2520M and the 8 GB of RAM are really nice (the laptop runs Windows 8.1 , installed in true UEFI mode, heavily modified too). The autonomy is between 5 and 6 hours (I use the same Ultrabay battery I use in th T400s), but there are two big problems : the keyboard is the same as the T400s one, but not the same brand and its not as firm, I hate it, the space bar wobbles... And the biggest problem is the screen, and thus the format of the machine... 16/9 and 1600x900. The difference is not huge compared to the T400s, but I curse it everytime I use the T420s... I practically never go out with the T420s for those two reasons. I will receive an X220 this week (2 units in fact :p), and I've wanted one for a long time. I will have the power of the T420s in the size of a machine between X61s and T400s while keeping the autonomy of the X61s and with a resolution between 1024x768 and 1440x900. It sounds good. And I cross my fingers to have an unit with a keyboard similar to my T400s or, even better, to my T410 – the firmest / most comfortable of my "recent" laptops' ! Like this guy I have experience or ownership of the x200/201 x300/301 t410s/420s. Even in its heyday the x301 was a very expensive machine with questionable performance under Win7. I feel that an x200 w/ a higher performance C2D like a P8000/9000 would probably show the 301 a thing or two. The x301 is a model of external design so if you like that sort of thing and its cheap enough then go for it. I actually used my x200 x300 t400s day to day as work machines granted I was never hugely far from a wall socket. Typically I would be connected to the network remoting to something while I had another machine w/ a com1 port on a cisco etc. These are usable machines given their limitations. Running a Intel 5300 wireless they were decent as net terminals. I feel that the SP9400/9500 in a 400s is problematic these days so I shudder to think what a U9400 or the SL1200 or whatever is in an X300 is like in 2018! I suspect a T61 w/ a modest cpu would show them a clean pair of heels and these are older. Garbage screens (significantly worse than the average TN) + no docking support. Battery life may be OK (since it's a ULV CPU) if you have the 6-cell + bay battery and both are in good shape, but with how old these machines are at this point, it's not easy to find batteries in good shape. These are almost perfect condition thinkpads for their age.